Top creative work in Africa on show at the travelling Loeries exhibition features all the winning 2015 creative campaigns. The most creative campaigns of 2015 in advertising, design, architecture, video, communication and much more went on show on February 29 when the Loeries Exhibition kicked off its national tour at the Vega School of Brand Leadership. Aimed at anyone interested in creativity and innovation in brand communication, the Loeries exhibition will travel to Pretoria, Stellenbosch, Cape Town, Port Elizabeth and Durban over the next seven months. Featuring award winning work from the continent’s top brands and creative minds, the exhibition aims to inspire the next generation of young creatives. “Developing young creative talent has been a core principle for the Loeries® since its inception in 1978, and this exhibition will allow youth to explore the opportunities that exist within the brand communication space” says Loeries CEO, Andrew Human. 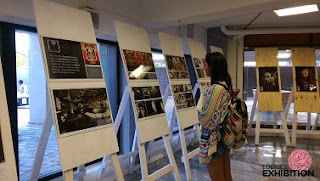 The exhibition is curated in a gallery style format from print exhibits to 3D pieces such as books and catalogues, along with projections of all the winning electronic work. The Loeries exhibition will run in Durban from September 5 to 9 at the Durban University of Technology followed by a further showing from September 26 to 30 at VEGA Durban.